I don’t usually post about my cats, but I’m going to make an exception with this post, as one of my cats has Chronic Kidney Failure (a.k.a. Kidney Disease), and I’ve read a small number of accounts of holistic medicine being positive for the condition, but very little facts. This post will therefore be updated as time moves forward to capture a diary of Bam’s journey. 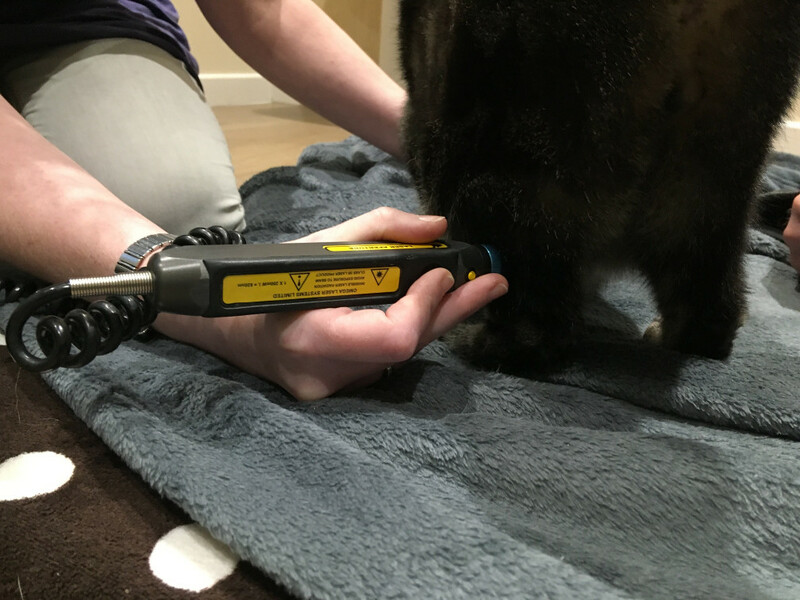 On 13th January 2017, Bam went into the vets for an operation on his teeth. Given his age (13 years at the time), he was given a pre-operation blood test to check if he was safe to have anesthetic… he wasn’t! Quickly I learned that he had hyper-thyroidism, and he went on a course of drugs before going in for radioactive iodine therapy in May 2017. The therapy went well, and his thyroid was reduced to the correct level. The only issue was that his kidneys had taken a pounding, and hence he had to move to renal foods, and take regular blood and urine tests, particularly focused on his creatinine and urea levels. In December 2017, he got his third set of results post iodine therapy, showing he was in stage 2 of the disease, and I asked the vet about the future. She said he may level out before further dropping, or may just drop all the way. Luckily she was open to holistic medicine, so when I said I’d like him to see an acupuncturist, she said she’d support, even though she had no evidence or experience of what it would do. 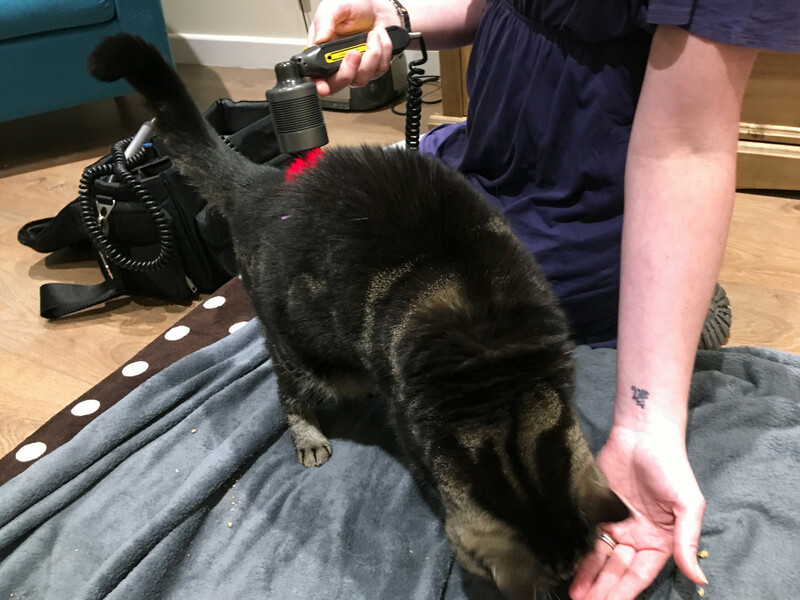 On 20th January 2018, Bam attended his first holistic treatment. 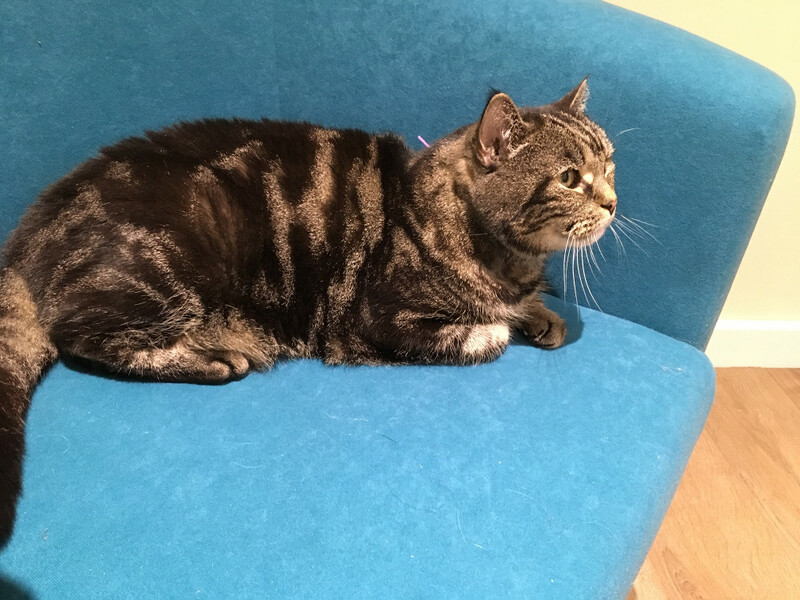 The room was more like a house than a vets (to help him relax), and he quickly relaxed with the therapist and I calmly chatting, and Bam checking out the armchairs, and soft furnishings. In short, we spent an hour in treatment. 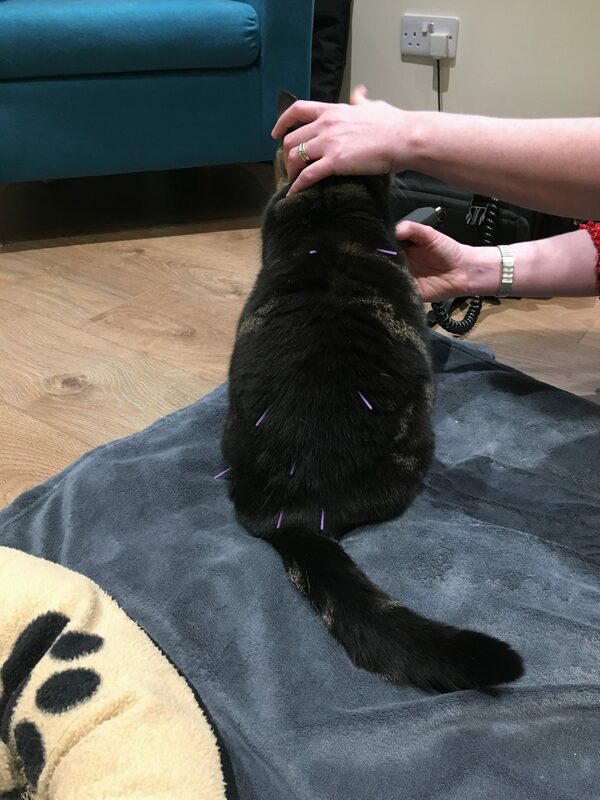 He managed a total of 5 needles, though he shook most out after 5 minutes, and we got about 4 in for about half an hour in the end. 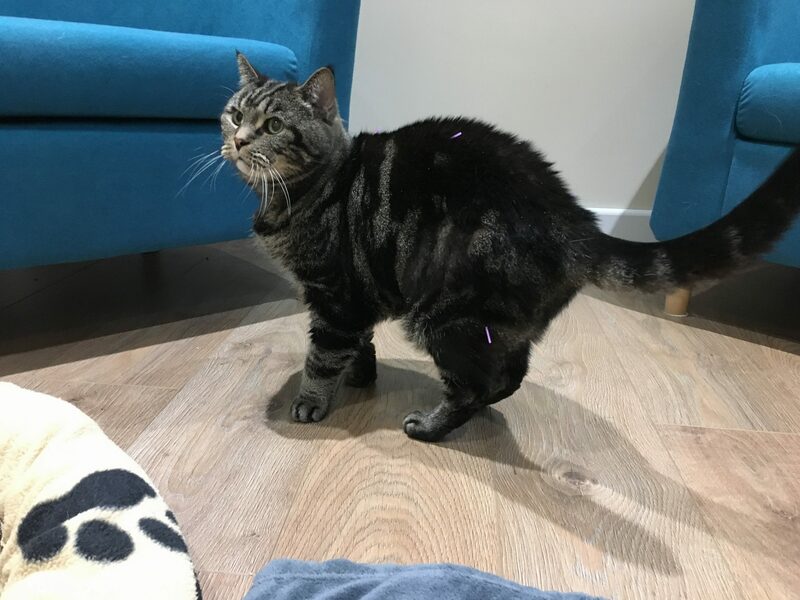 He also had a few minutes of laser acupuncture on his hind legs (as he didn’t like her trying a needle there), and 5 minutes of infra red therapy over the kidneys. The therapist said he had been very good for a first appointment, and we should do better next time. She hopes to prescribe some herbal remedies too next time. The best I have been told to expect is a stabilising of the condition, which won’t prove anything, but I’m not doing this as an experiment.. I just want the stability for him. 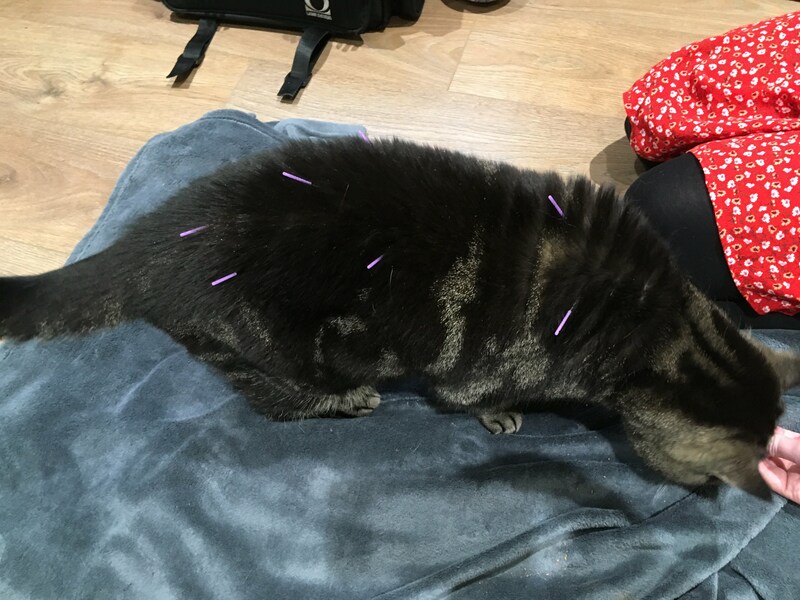 Bam attended his second holistic treatment on 27th January 2018. This went well, with us reaching 10 needles at one point. I believe about 7 stayed in, so a definite improvement. I’d played with him before the session, to burn a little energy, so he wasn’t as playful as the first time. I wasn’t sure if this helped or not, as he had been pretty amazing on his first visit. We took home a mix of herbs as a liquid, which I was to add to Bam’s food twice a day, with 5 drops. Happily cleaning himself while the needles do their thing! Bit of a back full! Getting ready for laser acupuncture. No worries here. A video too this week, showing how comfortable he is in treatment. He thinks everything is food, hence the interest in a bowl… even if it is full of needles! 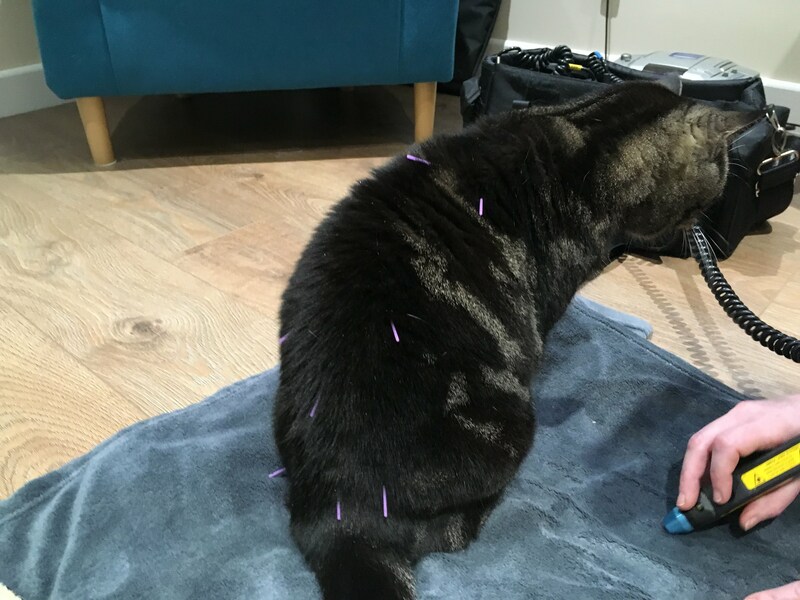 Bam attended his third holistic treatment on 2nd February 2018. This frankly didn’t go well. We wasn’t in the mood for it, and through the needles out twice after a minute or two of them being in. He hadn’t asked for attention that morning, so I wondered whether he was just having an off day (hey, we all do). 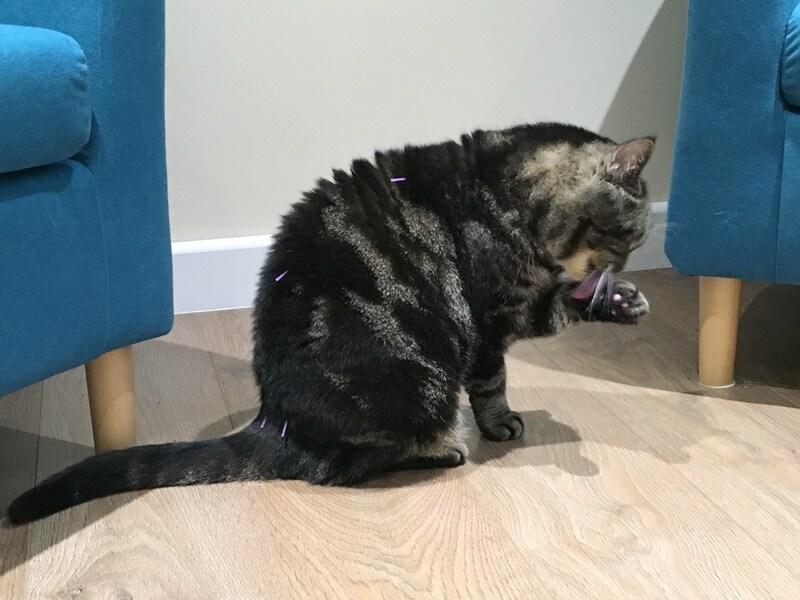 We got a bit of laser acupuncture done, but not a lot else. Never mind, he’s been amazing with the herbs until now (didn’t seem to knowledge the 5 drops in meals at all. We have arranged for another session in a couple of weeks, so will see if he’s back on form then. Another week has gone by, and I thought it was time for another update. I reduced Bam’s herbs to 3 drops twice a day all week, only increasing them again to 5 last night, as he was having diarrhoea. Fingers crossed his body has adjusted to the herbs now, he certainly is very happy taking them. It’s all subjective at the moment, but he asks to play more than he used to I believe. He has also put on some weight, so I’m having to reduce food to reduce him back to 5kg. I’m thinking to wait until late February before possibly getting new blood tests to see if anything medically has improved, or whether I’m just seeing things I want to in his behaviour. Bam has had a few appointments since I last posted, and his brother even joined him for the last one. My main reason for an update, is that I’ve updated the table above, following blood and urine test results. I need to get further information into what the results mean, but I understand the Phosphorus reading is stable and normal, the Urea is a small improvement, but the Creatinine is worse by quite a bit. The vet who gave me the results said it could be the herbs have a side effect, as other readings being stable or improved is a good side. Creatinine is however a complex measure. For completeness, we found a bump on his chest, which was tested at the same time. This turned out to be a fatty cyst. I imagine it is unrelated, but wanted to include it here in-case it means something to others going through a similar situation.